Northdixie Designs: To Crackle or Not to Crackle? To Crackle or Not to Crackle? Here's the latest progress on my latest Izannah Walker inspired doll. 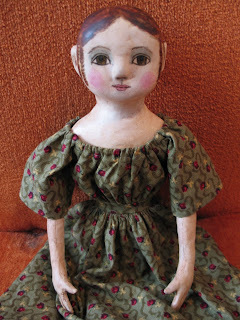 I made her a dress that approximates dresses I've seen on antique dolls of the period. I'm not so sure about the bulk at the neckline. Maybe if I finish and wash the dress a few times it will get that lived in look. But the big decision is whether to apply crackle finish to her or not. Truthfully, I like her as she is now, but I adore the way crackle adds an unplanned (and uncontrolled) spin to my creations. But they can ruin a doll, too. 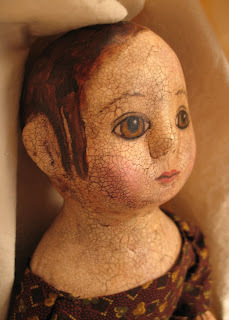 Here's my first Izannah doll with crackle applied (I loved that doll!). And you see the Crackle Candidate above. Oh, dear. I wonder what her fate will be. I like the aged, crackle look...it makes her look a bit more authentic...decisions, decision, decisions...they'll get you every time! Thanks, Denise and CARole. I went with an aged look but not crackle. I just love her the way she looks. I think she is beautiful. even though she gave you a hard time in the beginning.